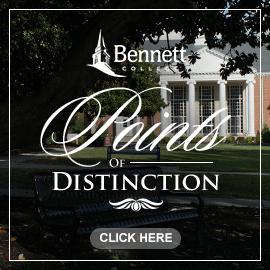 Under the direction of Dr. David Dallas Jones, the first president of the women’s college, Bennett accumulated several traditions which gave the college a unique atmosphere. Some of them, like the ringing of the bell, was a holdover from the days when the institution was co-educational. The bell was traditionally used to set the time for classes and meals. It was an honor to be appointed bell-ringer. Among the other traditions were those which involved dress. Whenever a Bennett girl went downtown she dressed with hats and gloves. Slacks or shorts were only worn on hikes or recreational activities, to work and breakfast. This was true of the campus until the middle 1960’s when students went through a period of protest. It’s a tradition on campus for freshwomen, dressed in white to make the walk through the Bearden Gates and across the campus to the Chapel for “Convocatum Est,” the ceremony where they are presented to the college and officially become Bennett College students. These students enter the gates for special programs such as Senior Day, Charter Day, the Baccalaureate Service and finally Commencement. Almost all of our formal ceremonies take place in the Chapel, under the gentle gaze of a stained-glass image of Mary, who reminds us that Bennett was founded in the basement of St. Matthew’s Methodist Church and continues to be supported by the United Methodist Church.